The Rise just got two extra octaves! The extra two octaves and wireless capability with the Noise app make this an appealing package. Key layout takes some getting used to. Last year we were impressed by the Rise 25, ROLI's more affordable version of its flagship Seaboard Grand, and we again commend any company that is brave enough to attempt the reinvention of the standard keyboard. The only real downside was its 2-octave keyboard but this is addressed with the Rise 49. We're really digging the current crop of 49-note keyboards (Prophet-6/JD-XA etc) as they strike a nice balance between portability and playability and the Rise 49 scores highly here due to its low profile, portable, yet tough design (though it remains to be seen how the keywave sensors and surface will stand up down the line). Like the Rise 25, the left side houses connections for a sustain pedal, an external power adaptor and two USB connectors (DIN MIDI via a breakout cable would have been great too). The Rise 49 can be powered via USB, an external power adaptor or by the built-in rechargeable battery (charges over USB). One of our criticisms of the Rise 25 was it relied on being tethered to a computer but, now that ROLI has its own Bluetooth app 'Noise', you can go fully wireless with the Rise range and any iOS device (no support for Android currently). We love that you can now roll up to a gig with any Rise model and an iPhone/iPad and have a fully self-contained wireless rig. ROLI also now includes a bespoke soft carrying case with the Rise 49 (Rise 25 came with just a polystyrene box), although you'll still need a full flight case for touring. "The five dimensions of touch allow sound-shaping that simply can't be achieved with a standard keyboard." Setting up the Rise 49 is a breeze - register at ROLI's website, create your user profile on the MY ROLI section, confirm your email and download the content for PC or Mac (or grab the free Noise app from the Apple App Store). You'll then receive the software manual, the MPE (Multidimensional Polyphonic Expression) capable Equator sound engine software and ROLI's Dashboard App for setting up the Rise 49 from your computer's desktop. On the left of the Rise's front panel are a combined mode/power switch and white backlit performance controls. The switches/sliders are made from soft black silicone rubber (like the 'keywaves') and are smooth/grippy. The power switch changes colour to denote the operating mode (Expression, MIDI or Bluetooth) and there's an assignable XY touchpad for controlling multiple sound-shaping parameters in Equator or Noise (or it can control MIDI CCs for other connected DAW software/hardware MIDI instruments). Above this are three touch faders with backlit level strips which take on MIDI CC duties in MIDI mode and control three of the Rise's 'dimensions' in Expression mode - Glide, Slide and Press(ure). Above these is a switch for changing presets in Equator or Noise and this can also double as a MIDI program change switch. The Rise's five 'dimensions' are key to the Rise's uniqueness. Strike = MIDI velocity; Press = aftertouch which can send channel or poly MIDI messages so that you can affect all, or each note in a chord individually; Glide = left to right finger movement for vibrato/glissando; Slide = the vertical movement of your fingers up/down the keys (great for adding filtering/tonal changes); and Lift = lifting your fingers off the 'keywaves'. The Rise 49 uses the same keyboard as the Rise 25 (albeit two octaves longer, allowing you to play full chords and basslines simultaneously) and it's made from high-quality non-toxic silicone rubber which is soft yet resistant, plus smooth and rubbery! The 'black' keys have white stripes down their centres for a quick visual reference point but all the keys are narrower than on a standard piano keyboard. While it's great that the black keys extend down all the way to the front edge of the white keys in a narrow ridge (so you can slide smoothly from a white key to a black key), this will likely throw off 'standard' keyboardists and it does take some getting used to. As a bonus, the strips of space above and below the keys can be used for pitch slides and glissandos too. Having five dimensions of touch available simultaneously via single/multiple keys (plus all the assignable left panel control) lets you achieve sound-shaping that simply can't be achieved with a standard keyboard and this is the Rise's key selling point. The 'keywave' keyboard works well for most sound types, though you do need to adapt your technique compared to a standard keyboard - the biggest obstacle is the white keys being narrower than the average finger (due to the black keys extending forward so far) and consequently you need to play chords very accurately and in a more claw-like fashion with the tips of your fingers in order not to hit the wrong notes (although it's easier to play monophonic lines more cleanly). £949 is a fair price considering the technology onboard, plus it's built in the EU and the new Noise software is very capable. For anyone bored with standard keyboards, the Rise is an exciting option that brings to life any sound type and we feel the future of the keyboard is in good hands with ROLI. 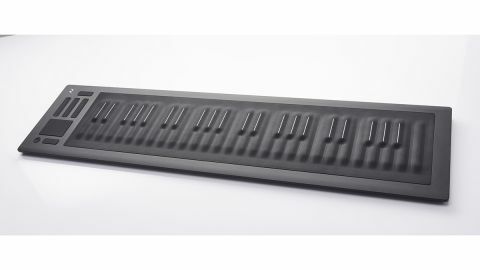 However, now that we've spent time with both Rise units, we feel that alternative models with key spacing matching standard keyboards would expand the appeal of the Seaboard ranges greatly and simultaneously eliminate the need for keyboardists/pianists to adapt their playing styles/techniques.